I’ve been in my house for almost a year and I’m at the point where I’m working on the finishing touches. 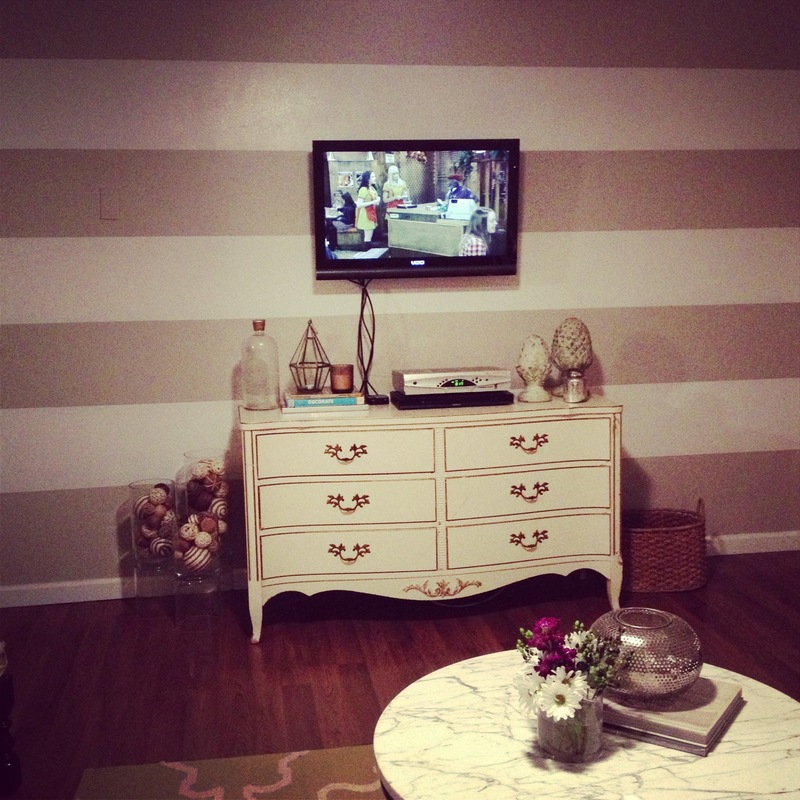 I’m a sucker for stripes and never get tried of them, so after hanging my TV on the wall I thought they would be the perfect accent. After doing a bunch of research online for the best practices on painting stripes I decided to tackle the project and below is my take on it. Mark out the stripes – Measure the total height of your wall from bottom of your crown molding to the top of your baseboard. It’s best to use odd number of stripes. My total wall height was 90 inches, divide that by 7 = 12.8 inch stripes. If you want bigger stripes divide by 9, if you want smaller stripes divide by 5. Doing odd numbers gives you the ability to leave your base color as the top and bottom stripes, that way you don’t have to touch the crown molding or baseboards when painting. Cuts your time in half. Best tip I found, if you have “leftover” inches at the bottom, it is okay to make that stripe a little bigger, no one will notice! Tape out the stripes – I have a nifty laser level but I went old school with this and used just a regular level (I think I just haven’t taken the time to learn how to use the laser level). Just guide the level along the wall as you tape. Tip: I used pieces of tape as “Do not paint” markers on the sections that were not to be painted white. Paint! Once the second coat of paint is on and the stripe is fully filled in, take the tape off. 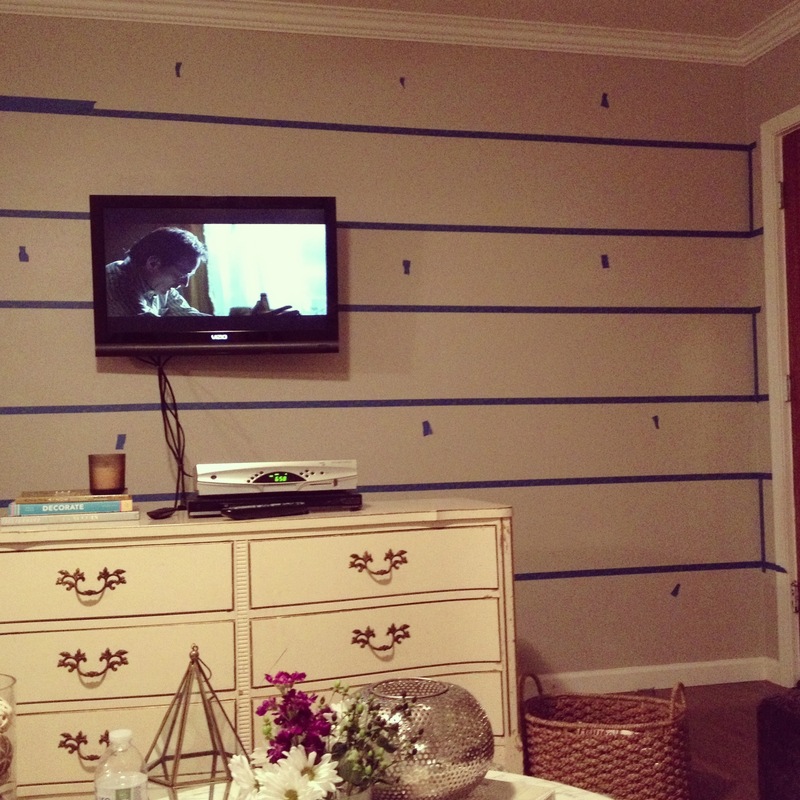 No need to wait until it is completely dry, otherwise the tape will be glued to the wall. Use disposable rollers and painter tray, it will only cost you a few dollars and definitely better to just throw that away then taking the time to clean them. I have a bad habit of leaving wet paint on brushes, so I take all measures to prevent this. But it never fails because as I type this it makes me realize I forgot to wash the brush I used to paint the corners (picture me running to my shed to confirm this and immediately putting the brush into cleaner).